Supporting education has been a major focus for Crowley over the years in its efforts to give students an opportunity for a bright future. Since 1984, Crowley has provided more than $3 million dollars in scholarship funds to more than 1,000 students. 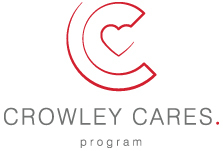 Crowley has also donated about $2 million to education programs. Each Crowley location has the freedom to choose which charitable organizations to support through mentoring, volunteerism, fundraising and financial assistance. From homeless shelters to children’s homes, Crowley employees throughout the world make a difference in the communities they serve.